Livable remodeling is the concept that remodeling need not be painful for the client. It means utilizing best practices to ensure your home remains organized and dust free during the project. Your livability is our top concern during a remodeling project. As a clean contractor we take pride in limiting the biggest threat to liveable remodeling: Dust. In large concentrations construction dust can worsen allergies, respiratory illnesses (such as asthma), and other conditions. 1) How much dust will the project generate? As noted, all projects produce dust throughout the process. You need to know the degree of dust that will be produced. 2) How will the contractor preserve your home’s livability? You’re not alone in worrying about this – about 90 percent of homeowners stay in their homes during projects. The best contractors will have a dust control plan that includes the latest technology and best practices. No plan? No deal. 3) How will the contractor make the plan work? A tip: A simple box fan, sheets of plastic paper and a vacuum cleaner won’t cut it. Not at your house. McManus Kitchen and Bath takes great pride in our worry-free remodeling experience and we took notice when we started hearing a manufacturing partner of ours talk about “livable remodeling”. The concept is simple, complete the project in a manner that makes living through the work acceptable – and makes sure that all aspects of the job, including dust management and indoor air quality, are being addressed. Dust and indoor air quality (IAQ) is a focus of this concept because multiple dust generating events (i.e. demolition, dry wall sanding, etc.) will occur during the remodeling process. 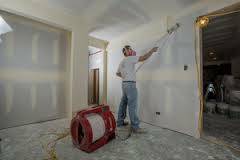 Unmanaged construction dust can cause health issues , damage belongings, decrease your satisfaction with the project, and just become a huge irritant. You are not just investing in a job well done, you also would like to maintain a great home life during the project as well. To provide you and your family with the best remodeling experience, from start to finish, we invested in the newest dust control technology to incorporate into our dust control plan and best practices. than your average bath fan and it can recycle all the air in a typical bathroom in under two minutes. 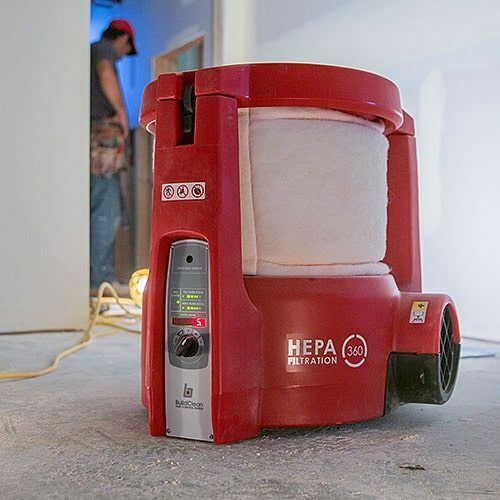 Using the BuildClean Dust Control System we will capture and remove up to 90 percent of airborne dust that accumulates during your remodeling project. McManus Kitchen and Bath incorporates a number of best dust management practices along with the BuildClean Dust Control System inlcuding the use of ZipWall dust barriers and specialized drop cloths and sticky mats. Zip Wall Barriers allow us to easily install plastic containment zones around the work area. With zipper doors and dust collection mats at the opening the Zip wall barrier keep any dust from leaving the work area. 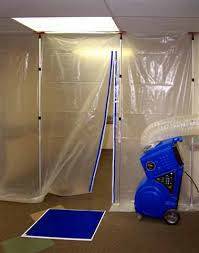 With this practice dust is actually trapped and contained within the job work area – and then eliminated. This keeps the areas outside of the construction site cleaner. And keeps construction dust from lingering in your home months after the work is done. BuildClean: a Revolution in Dust Management. from ITW BuildClean on Vimeo. If you have any questions about livable remodeling or job site dust control please give us a call.